Background: Esters of fatty acids with alcohols especially polyols (polyhydroxy alcohols) have found considerable applications as synthetic greases, synthetic lubricants, in cosmetics, food, and paint industries. Industrial or conventional esterification is carried out by the condensation of carboxylic acids with alcohols in the presence of an acid catalyst of homogenous nature. The development of heterogeneous / solid acid catalysts owing to their safe handling, stability, facile recovery and recycling ability for esterification reactions has been a subject of great scientific interest. However, the reported methods have been used for the esterification of acids with mono-alcohols. To the best of our knowledge, there is no report on the use of graphene-based carbocatalysts for the esterification of fatty acids with polyhydroxy alcohols. 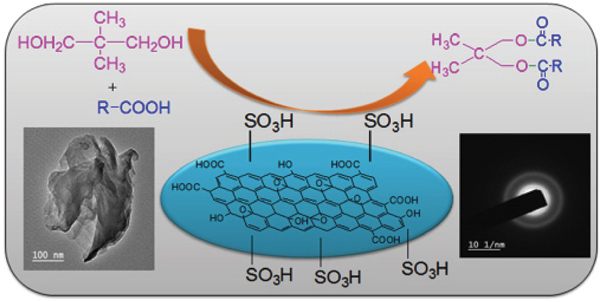 Methods: The desired sulfonated graphene oxide (SGO) was synthesized by following the two step approach in which first step involves the synthesis of graphene oxide (GO) from oxidation of graphite followed by sulfonation with sulfanilic acid under diazotization conditions to give SGO. Esterification of fatty acids with polyhydroxy alcohols was carried out using 5 wt % of SGO as a catalyst in toluene at 110 °C for 6 h.
Results: A number of experiments were performed to optimize the reaction parameters for esterification of 2,2-dimethyl-1,3-propanediol (DMPD) with caproic acid (C6 acid) as model example. The optimum condition for the esterification was found to be 5 wt % SGO, 6 h reaction time, and 110 °C. After optimizing the reaction parameters, the scope of the reaction was further extended to a variety of long chain fatty acids. The presence of electron releasing ethyl group in 2-ethylhexanoic acid had poor effect on the conversion. Conversion and selectivity were determined by GC-MS. Conclusion: The present paper demonstrates the preparation of SGO from GO and sulfanilic acid through diazotization route. The synthesized solid acid carbocatalyst was used in the esterification of fatty acids with polyhydroxy alcohols for bio-lubricant applications, which is an important branch of green chemistry. Importantly, the carbocatalyst showed excellent recyclability, which suggested high stability of sulfonic acid groups in SGO. Carbocatalyst, esterification, fatty acid, graphene oxide, polyol, SGO.